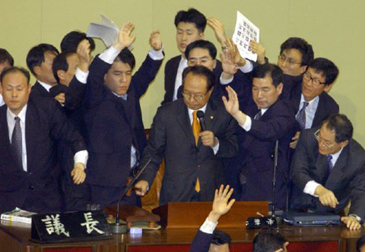 Surrounded by the guards and conservative lawmakers National Assembly Speaker Park Kwan-Yong (center) is proceeding the impeachment of President Roh Moo-Hyun in the plenary session of the assembly March 12, 2004. Of 271 registered members 195 members, all opposition members of the assembly, participated in the voting. Of them 193 voted yes whereas only two voted no to the president's impeachment. Innovative news coverage on the Internet added fresh viewpoints to the South Korean media, but the ruling Uri Party's proposal for newspaper reform caused concern in 2004. The active and varied media, while politically divided, avidly covered political scandals, including the messy impeachment of President Roh Moo Hyun in March. While local television news stations reported scuffles in the National Assembly in which legislators threw punches — and shoes — at each other, a legion of "citizen reporters" recruited by the upstart Internet news site OhmyNews.com covered tense demonstrations against the impeachment. Meanwhile, the country's three largest newspapers — the conservative dailies Dong-A Ilbo, JoongAng Ilbo, and Chosun Ilbo — kept up a steady stream of editorial vitriol against the president. Two months after Roh was impeached on charges of violating election laws, the Constitutional Court reinstated him. The unpopular impeachment apparently backfired on the opposition Grand National and Millennium Democratic parties; the pro-Roh Uri Party won a majority in April's National Assembly elections. Chosun Ilbo accused the public broadcast media of "urging the masses to riot" with biased coverage of the impeachment and the anti-impeachment demonstrations. The Grand National Party argued that "one-sided reports of TV broadcasters are a serious problem distorting democracy." Of South Korea's three major television networks, only the Seoul Broadcasting System is not state-owned. 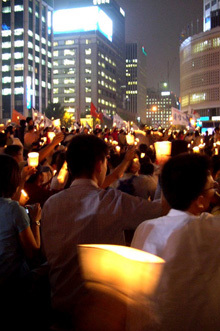 Hundreds of thousands of South Koreans are staging a candle-light protest against President Roh's impeachment. The president and the newspapers tussled over his decision to move the administrative capital from Seoul to the rural Yeongi-Kongju area, roughly 100 miles (160 kilometers) to the south, as well as election-law scandals, high unemployment, and relations with North Korea. In 2003, Roh sued the country's top four newspapers for civil defamation, disputing reports that accused him of making questionable real estate investments. In June 2004, Roh dropped the charges because, as administration officials put it, "The president concluded that it is undesirable to go on with the suits while he is in office." In October, the Uri Party proposed a media-reform bill that appeared to be a head-on attack against its ideological opponents in the conservative newspapers. The bill would limit the three largest papers' total share of the print media market to 60 percent and bar any one paper from taking more than 30 percent. Currently, the three largest dailies control 70 percent of the market. Some analysts warned that while the proposal would wrest influence from the small circle of powerful families controlling the dailies, passing the bill could stifle government criticism by limiting the most consistently critical press. Opposition parties succeeded in blocking the bill's passage before the regular session of the National Assembly adjourned in December. The Uri Party also proposed repealing the National Security Law, an anticommunist measure dating back to 1948 that has often been used to penalize journalists for "antistate" reporting, especially material sympathetic to North Korea. Demonstrations and the fierce objections of the Grand National Party stymied the repeal effort; conservatives argued that the law is necessary to maintain security safeguards against North Korea. In November, the Ministry of Information and Communication invoked the National Security Law to block 31 North Korean and pro-North Web sites. Any South Korean visiting these sites risks a three-year jail sentence. Reunification with North Korea has popular support in South Korea, and perceived threats to inter-Korean relations provoke strong reactions on all sides. In the spring, North Korean defectors launched an Internet-based radio station, Ja Yoo Bukhan Bangsong (Free North Korea), to promote democracy in the North. A visiting North Korean delegation condemned the station, and a barrage of threatening phone calls, letters, and e-mails from angry listeners forced the station out of its quarters at the Institute of North Korean Studies. It now broadcasts from privately rented offices. With an estimated broadband penetration of 75 percent, South Korea may be the world's most wired nation, according to Fortune magazine. The Internet has played a decisive role in the development of South Korea's media and politics. Many of the country's younger citizens, who constitute a formidable presence at the polls, get their news exclusively from the Internet. While they grapple with issues of responsibility and ethics, online sources like OhmyNews.com, which recruits "citizen reporters" to cover the news, offer a rich diversity of perspectives that contrasts with the ideologically entrenched media establishment. President Roh Moo-Hyun was reinstated by the Constitutional Court on May 14, 2004. 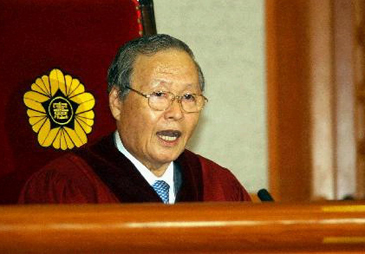 Roh was impeached by South Korea's opposition-dominated National Assembly March 12, 2004. Internet news sites have posed a financial challenge to newspapers and TV channels, according to local journalists. The Internet has also opened the playing field for commentary, criticism, and debate in South Korea's animated political landscape, a development that has coincided with the dismantling of the press-club system, which began with Roh's abolition of the press club at the presidential offices in 2003. The old system allowed a closed circle of reporters from major news outlets to set news coverage, sometimes in conjunction with government officials. With increased access, more journalists have the freedom to report on government-related news. The above article is from CPJ (Committee to Protect Journalists).